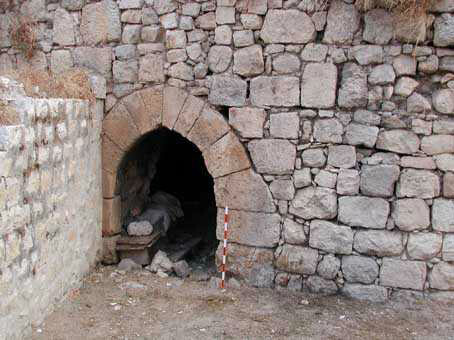 During September 2003 a salvage excavation was conducted in the middle of el-Bi‘na village (Permit No. A-3983*; map ref. NIG 22580/75968; OIG 17580/25968), prior to construction. The excavation, on behalf of the Antiquities Authority, was directed by E. J. Stern, with the assistance of N. Getzov (early pottery and flint implements), V. Essman and V. Pirsky (surveying), Y. Ya‘aqoby (administration), H. Smithline and C. Amit (photography), R. Abu Raya (inspection), E. Belashov (drafting), L. Kupershmidt (metallurgical laboratory), H. Tahan (pottery drawing), M. Smilanski (flint drawing) and laborers from Kafr Manda. El- Bi‘na village is located on the northern fringes of the Bet Ha-Kerem Valley. 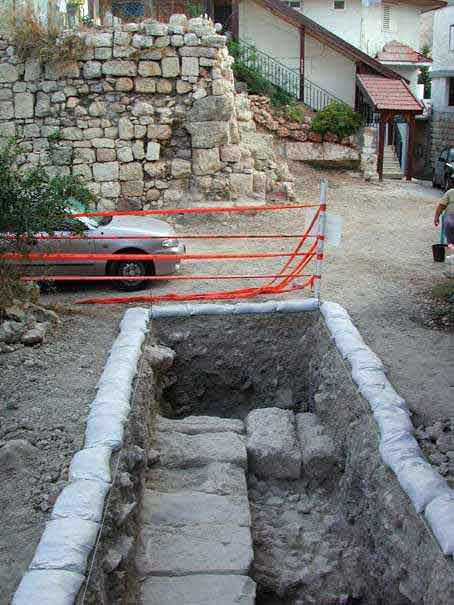 The excavation was conducted at the highest point of the village, where an archaeological tell is likely to have existed and next to the remains of a building from the Crusader period that are visible on surface (Figs. 1, 2). An area (c. 3 × 6 m; Figs. 3, 4) was excavated, wherein three main building phases that dated to the Roman, Mamluk and Ottoman periods were exposed. Flint implements and potsherds, dating to the Neolithic, Late Bronze Age, Iron Age, the Persian, Hellenistic, Byzantine, Early Islamic and Crusader periods were also discovered. Neolithic Period. 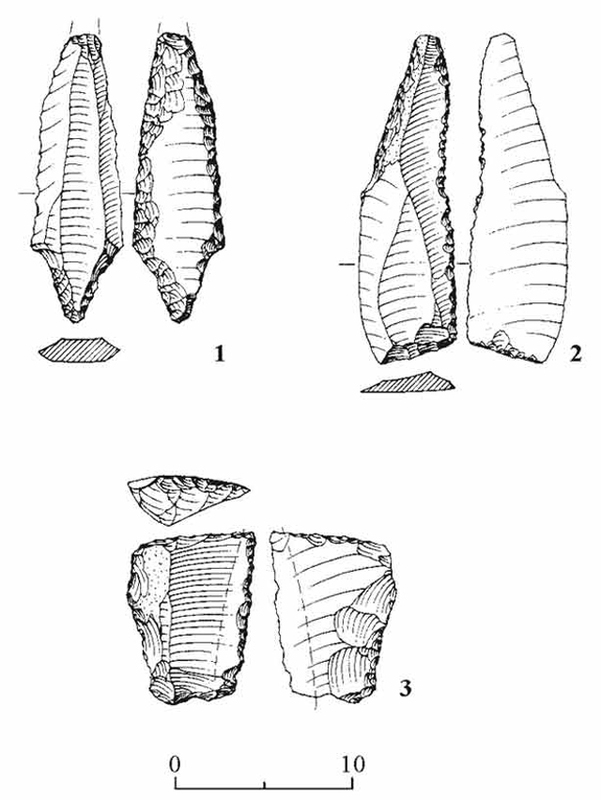 A flint ‘Byblos’-point arrowhead that dated to the Pre-Pottery Neolithic B period was found (Fig. 5:1). Late Bronze Age. Flint implements and numerous potsherds that indicate a settlement at the site during this period were uncovered in the fill throughout the excavation areas. 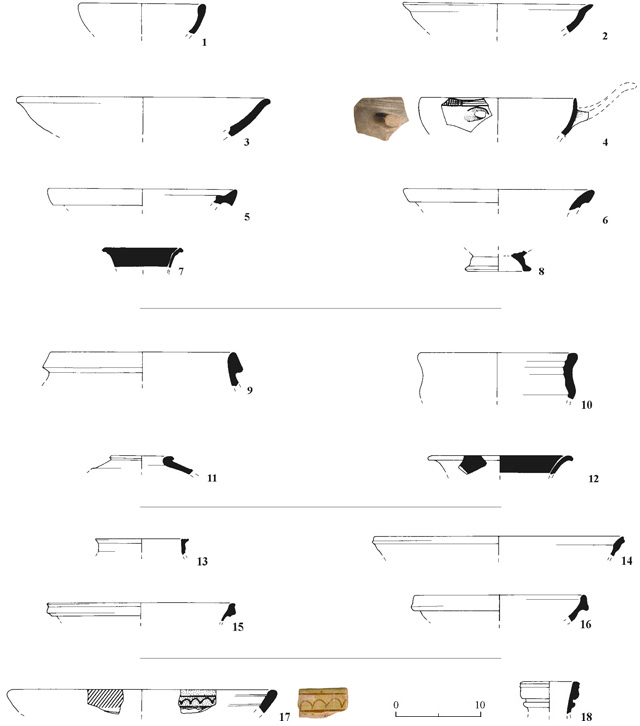 The flint items included sickle blades (Fig. 5:2, 3), as well as industrial debitage. The pottery vessels consisted of bowls (Fig. 6:1–3), cooking pots (Fig. 6:5, 6) and imported Cypriot vessels, such as a milk bowl (Fig. 6:4) and fragments of a bilbil (Fig. 6:7, 8). Iron Age and the Persian and Hellenistic Periods. Potsherds indicating the site was inhabited during these periods were found, including a cooking bowl and krater from the Iron Age (Fig. 6:9, 10), a jar from the Persian period (Fig. 6:11) and a bowl from the Hellenistic period (Fig. 6:12). Roman Period. A massive wall (W14), oriented north–south, was preserved a single course high. It was built of large ashlars (0.5 × 0.5 × 1.0 m) with diagonally drafted margins and its complete width was not exposed. The foundation consisted of hard limestone and packed earth (at least 0.7 m deep). W14; hence, it belonged to the same building. The continuation of the water reservoir was damaged in the past by mechanical equipment. 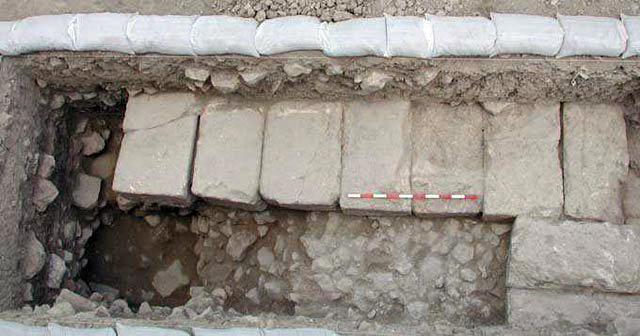 At the bottom part of a later wall, c. 5 m south of the excavation area, was a section of a wall built in a similar style to W14 and it probably also belonged to the Roman-period building. Byzantine and Umayyad Periods. A few potsherds from these periods, particularly the Byzantine period, were found in the fill above and below the floors of the Mamluk and Ottoman periods. 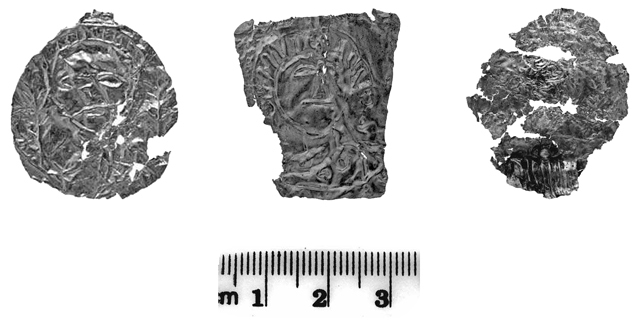 The Byzantine period was represented by a LRC3 red-slipped bowl fragment (Fig. 6:15) and few sections of mosaics, which were not in situ and consisted of small white, red and black tesserae, attesting to the presence of a luxurious building that once stood nearby. Five creased pieces of gold leaf were found; two of them bear the clearly distinguished features of a person’s face, surrounded by a halo (Fig. 9). These should be dated to the Byzantine period based on the style of the decoration. The Umayyad period was noted by a red-slipped bowl of Egyptian origin (ERS), dated to the seventh–eighth centuries CE (Fig. 6:16). Crusader Period. A few potsherds from this period were found, although a building ascribed to it stands c. 5 m north of the excavation area. The building is incorporated today within some of the village houses and it seems to have had an addition that is dated to the Ottoman period. The building has several halls that are covered with barrel or cross vaults and it is built of ashlar stones in the style characteristic of Crusader construction, as manifested in openings with a pointed vault (Fig. 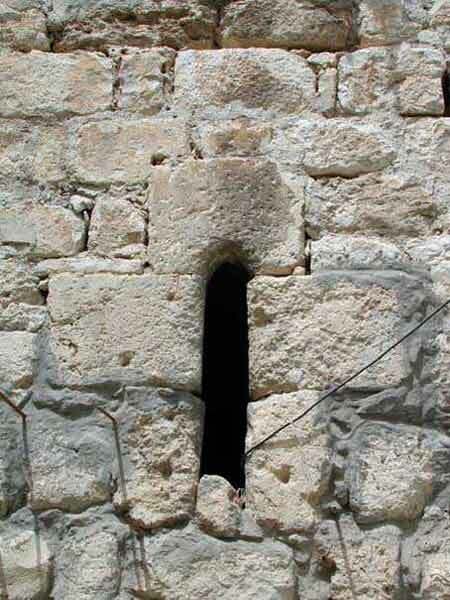 10) and a window shaped like an arrow slit (Fig. 11). Mamluk Period. A floor extended east of W14, which served as an enclosure wall in this period. The northern part of the floor was composed of small fieldstones and tamped earth and its southern part was tamped plaster. West of W14 was a wall (W21), built of square fieldstones and aligned east–west, which although not well preserved, seems to date to this period of time. Pottery vessels, including a glazed bowl decorated with thick incising (Green and Yellow Gouged Ware; Fig. 6:17) and a jar (Fig. 6:18), were found. Ottoman Period. The upper stones of W14 were incorporated within a floor that extended east and south of it. The floor, delineated by two walls (W18, W19), consisted of different-sized flat fieldstones and was overlaid with a layer of fine-particle brown soil that contained four stones arranged in the shape of a fallen arch, which were the remains of the collapsed ceiling. It seems the building should be dated to the end of the Ottoman period or the beginning of the British Mandatory era. The massive building remains from the Roman period point to a spacious structure that was probably a public building. 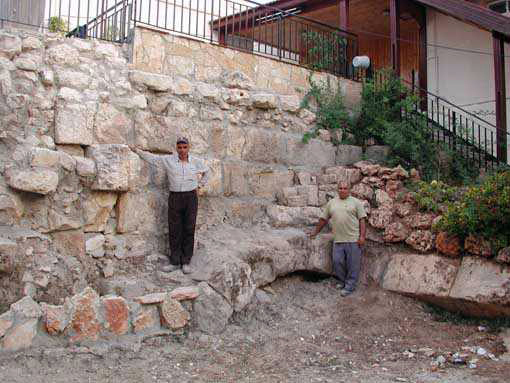 It seems the Crusader building made secondary usage of the Roman wall that was preserved to a considerable height––a rare phenomenon in the Galilee. The Crusader building remains probably belonged to a seigniorial castle that served as the center of the St. George de la Baena fief, mentioned in historical sources. It is noteworthy that no other remains from the Crusader period were found, except for a few potsherds. 1. 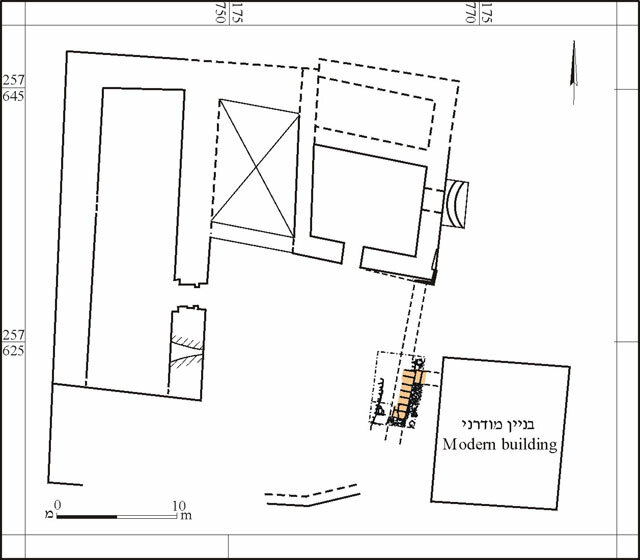 The excavation and nearby ancient remains, plan. 2. Remains of the Crusader-period building, looking northwest. 4. The excavation area, looking west. 7. 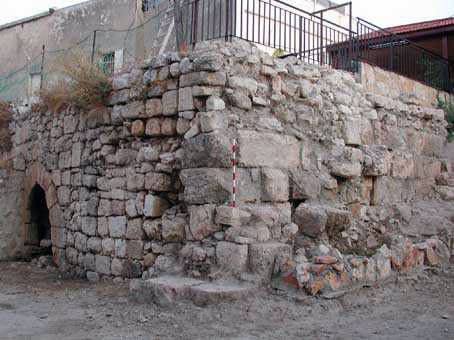 Wall 14 and its continuation in the Crusader building, looking north. 8. Remains of a water reservoir, looking west. 9. Pieces of gold leaf. 10. The Crusader building, an opening with a pointed vault, looking north. 11. The Crusader building, a loophole-shaped window, looking west.